I have heard so many good things about this series lately AND I heard it was being made into a movie. There's nothing that makes me pick up a book quick like hearing that it will be on the big screen! Does anyone else do that? It's like the second I hear the announcement, I have to read the book. Anyways, Cass did not let me down. I absolutely loved the main characters as well as the setting. It is fast paced and a very easy read. The main character America is ambitious, strong willed, and easy for the reader to love. She is relatable and just so normal. Also, with a name like America... I think Cass may have wanted readers to associate her with normalcy. The setting is fantastic as well. It's not all rainbows and butterflies. The main setting is a fancy palace, yes, but the setting of the entire book is a a broken society filled with a cast system of broken citizens. 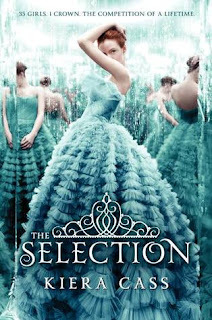 I love how The Selection allowed young girls in every cast to have the chance at a fairy tale happy ending. Yes, there was some cheesy drama, but that is to be expected when the book is about 35 girls living together in a castle. Cass did a fantastic job of fleshing out all of the characters and making each of them have their own individual personality as well as their own unique relationship with America. I absolutely adored this book from start to finish and can't wait to hear what happens next to my dear America Singer in her search for love. If you are looking for a quick and fun read, The Selection should be top on your list, but be prepared to read The Elite and The Heir as well! I would highly recommend this series to those of you who love young adult fiction. Check back later in the week for my reviews of books 2 and 3 in the series.